Beef Coca Cola Pot Roast AKA “Pop” Roast! 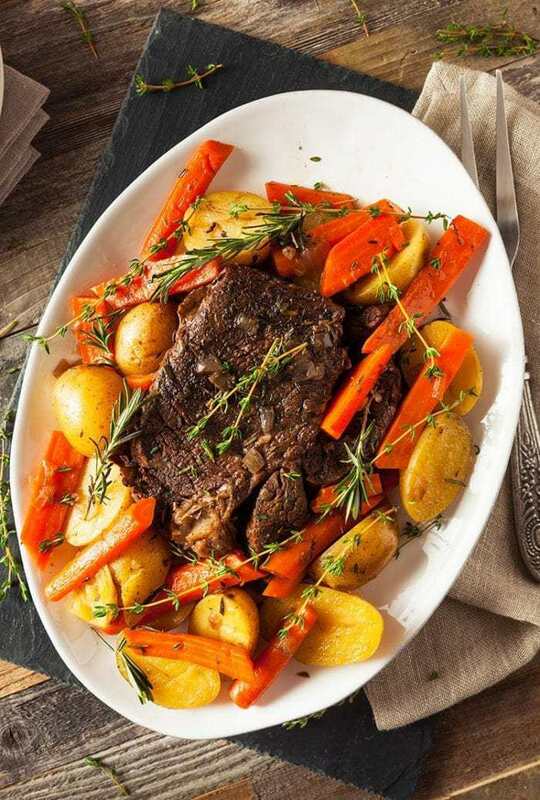 It’s a crazy concept for sure, but using soda or pop ( coke) with your roast beef is actually one of the most delicious ways to make a pot roast! Who on earth puts Coke into a gravy and then onto a roast? This delicious concoction took a lot of trust for me to attempt.After searching the internet and realizing that every single recipe I came across had rave reviews about using a cola soda on roast beef, I had to try it. And it was meant to be; I actually had full-sugared Coke in the fridge, which is a rarity, usually if there is pop, its diet. I was told once that the term “pop” can be a uniquely regional term for soda, so for those who aren’t familiar with it, if I talk pop, I mean soda or soft drink. By regional I also mean that every Canadian I know refers to it as so. For this recipe I used a large, long blade or chuck roast, and this meal would safely feed 6-8 adults. I love the fact that its a one-roaster meal, is amazing to serve to guests and is incredibly easy! A tip for a better roast: if you leave it in the fridge for 2 days before serving, it tenderizes the roast right up. This was the cheapest roast ever, but after two days i n the fridge, it melted in our mouths after cooking! Oh my carrots, my bountiful, gorgeous carrots that we have been eating daily. We are going to sprout whiskers and start hopping. Which, coincidentally, as a rabbit owner, I know is a fallacy; they are NOT the best food for rabbits. But for the sake of a cliche, we’ll go with it. Get a big dang roaster. Biggest you have. The one I use was a wedding gift, and one of my favorites still. It fits a turkey, it will cook this roast and enough veggies for 8 adults, the possibilities are endless. It’s a son-of-a-gun to find the space to store, but so worth it! Chop up all the veggies you need, go big or go home! Fill it up! You’re feeding a horde! Leftovers are very, very good. Throw in a few cloves of garlic as well, as many as you like. The beauty of this recipe is that you can make it small, or you can make it large, there is so much sauce, plus water from the veggies that you don’t have to worry about anything drying out. Rarely is there a one roaster meal that you can serve at a dinner get-together. Make this in the slow cooker! You can easily make this in the slow cooker, if you don’t mind the vegetables being softer and not roasted! Simply follow the instructions as is and place into a slow cooker instead and cook for 7-8 hours on low! Serve and enjoy! It has the traditional flavor of roast beef with a slight sweet flavor, just the right amount. Check back to see what I made with the leftovers, I love when a meal stretches over two meals! PIN THIS RECIPE to your BEEF RECIPES or DINNER IDEAS Board and Remember to FOLLOW ME ON PINTEREST! Beef Coca Cola Pot Roast AKA "Pop" Roast! Beef Coca Cola Pot Roast AKA "Pop" Roast! 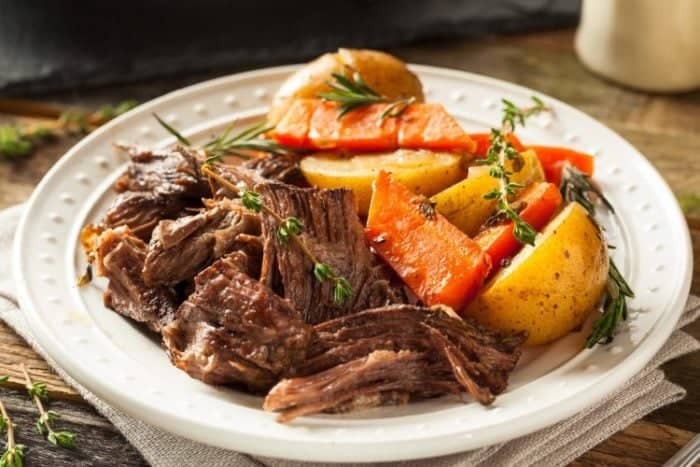 It's a crazy concept for sure, but using soda or pop ( coke) with your roast beef is actually one of the most delicious ways to make a pot roast! In a large frying pan, sear the roast on both sides. Salt and pepper, then place into a very large roasting pan. Place the garlic and the chopped vegetables around the roast. Whisk together the remaining ingredients and pour over the roast. Place the roaster lid on and place in the oven. Cook for 4-5 hours until the roast pulls apart nicely. In a large frying pan, sear the roast on both sides. Salt and pepper, then place into a slow cooker. Place the garlic and the chopped vegetables around the roast. You can put in whole potatoes to make sure they don't fall apart, and very large chunks of carrots! Cook for 7-8 hours on low until the roast pulls apart nicely. Worked great, thanks for the recipe. surpisingly good! The whole family loved it and you can’t taste the cola in it! pretty fun recipe, tbh, so I gave it a whirl. Definitely going on the once in a while list, the kids thought that the cola in it was hilarious! Easy and I made it in the crcokpot like you suggested. THe whole potatoes worked great and you can’t even tell that there is soda in the gravy! Thanks again for a great recipe. I highly doubt it LOL! It also has mushroom soup in it! I love it anyways. I’ve also heard RIBS are amazing in root beer…I need to try that recipe too! I wonder if cooking gets the bad stuff out of Coke.